Fully equipped specifically for “wild camping”. 89000 miles. New timing belt and water pump / altenator belts. Oil and filter just changed. New Clutch at 77,000 also new front suspension units (McPherson Struts). All lights except the Headlights are LED. Unique “MiniDub” front end all steel (custom built for this van) – 7 inch Lucas type headlights as used in LandRovers, Morgans etc. The headlights in HiJets are a well known source of problems, these headlights negate the “glow-worm problems”. Tow bar for small trailer this also supports the rear step. Early single skin, On the roof 100 watt Solar Panel, 110 amp hour leisure battery, IndelB compressor fridge, 30 litre CAK water tank. Windows had the rubbers replaced last year, front Fiamma rooflight replaced with a slightly larger Mini Heiki, the rooflight at the rear above the galley has also been replaced. External 12v socket by the door. Several 12v sockets in bunk side. 2x gas cylinders one full the other part used. 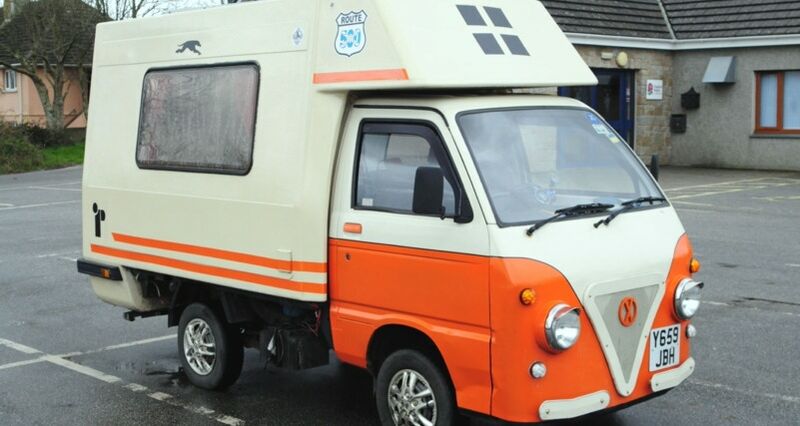 It is already to go as I have just completed preparing the van for the summer, when a larger van of the exact type I hankered after came up at a price I could afford.